GT: Awesome links, thanks! Nice to get up-to-date stuff (or reasonably so, anyway). Thanks for clearing up the NS line issues, and the traffic limitations. I'm sure NS would love for the state to finance upgrades! James: As for where the people are, connections, etc., that's a fairly obvious statement. Unfortunately, "Rome" will burn while we wait for bidding processes, environmental and other studies, etc. while they discuss links to downtown (I think the Amtrak line would need to access the disused or lightly used Belt-line to get to Five Points). Can you imagine how many years it will take to build a terminal at "Terminus"? We're talking a decade at least. On the other hand, you can get the "Amtrak" line and the Lovejoy line under way pretty quick. The "Amtrak" line, as noted, would probably serve the most people. As for connections, they run very quickly to Arts Center station, and if you have a bus waiting there (a new line?) it would be even quicker, and you could add a MARTA rail shuttle to Lindbergh and Atlantic Station pretty easily (well, as easily as it gets.....). Why not have a terminal station on the Gainesville Line on the old connecting track to Atlantic Steel (now Atlantic station) and add a platform at the Lenox MARTA station or at Doraville? Then run a Gainesville, Atlantic Station train with a direct MARTA connection. 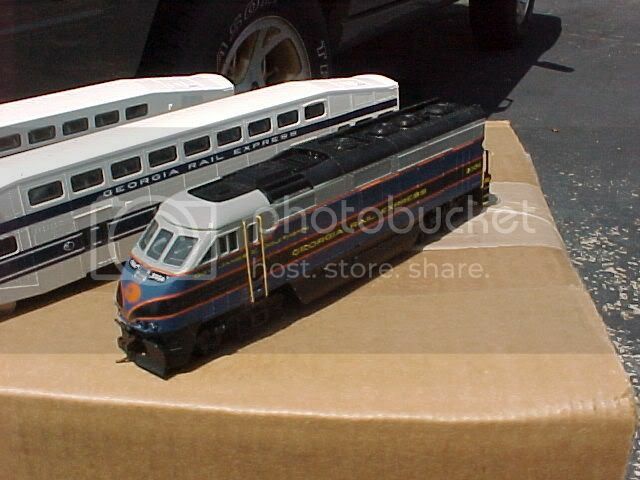 Don't know where to store the train sets, though - maybe at the Southeastern RR museum in Duluth? Great ideas! Why not both? I think they would serve commuters well, and would add Lindbergh. I like the idea of an Atlantic Steel (Station) terminus, and I think the GA 400 tolls paid for some property around there (it was a big controversy). However, you have the issue of poor connections even more so, and need a station building. The track is still there, but I think you could store the trains very easily just north of Peachtree in some yards in that area. For those who asked "Why Lovejoy", it's also because Federal funding exists... Well at least until the end of 2008. Good job politicians for letting it dry up! Don't do Amtrak... They are overpriced. If Amtrak worked, then a new commuter line wouldn't be planned from Hartford to New Haven, CT.
stop wasting time on atlanta.. nothing is ever going to happen there, the place is totally encompitant at getting anything to work.. move someplace that already has a porject underway, or already has commuter rail. like I did. it took sonny and the atlanta politicians continuous bickering, but they finally have run georgia into the ground. EVERY person I know from high school there has left. Atlanta has become the posterchild of what NOT to do with your metropolitan area. Even Nashville got the message and did something about it. Really? Go to APTA this year and find out what Atlant'a's been up to - there should be a nice big article in the conference issue. This year's failure of the transportation bill soooooo pissed off the business community they threatened to pull the funding of the Speaker, Lt. Gov, and Gov that now they all are finally singing Commuter/Intercity rail with Griffin the first line including dedicated funding (in the middle of a budget crisis), hiring of a direct commissioner report for implementing commuter rail in the middle of a hiring freeze, and a State Transportation Board that includes commuter rail support from outside of Atlanta - notably from Houston County and Augusta. Remember, this is a state that had a segregationist as Governor when it approved one of three major heavy rail systems in the country and a city that has an extremely dominant business community. This state and region has a brief spate of progressivism about every 40 years, so it is about due (remember who gave the world Jimmy Carter - and we're still not sure about that, but it definitely was progressive). Also, in addition to AMTRAK, potential operators for commuter rail include Veolia who already run Cobb Community Transit, Gwinnett County Transit, and manage the 12 county GRTA Xpress bus system and Norfolk Southern (yes - they've made noises about bidding for the line to Griffin). GDOT is apparently releasing a report on today on capital and operating costs and potential opening dates. Also, the developer for the Ford site wants a rail station and MARTA branch. Developer Jim Jacoby has expressed interest in working with the state to open a commuter rail station at the former Ford plant near Hartsfield-Jackson Atlanta International Airport, a member of the State Transportation board said Thursday. Yes - at this week's GDOT board meeting in Perry the staff indicated that the line to Griffin would cost $193 + contingencies and the main drivers of the schedule were how long Federal Transit review process would take (could they just update the Environmental Assessment or do they have to redo) or length of time to procure vehicles since FRA compliant vehicles are in demand and mostly spoken for at this time. I love it when environmental laws are counter-productive. I certainly hope it doesn't. As for rail vehicles, lots of new stuff coming on in northeast. NJ is replacing much of their fleet, as is MNRR on the New Haven line. Now, the NH vehicles don't really lend themselves to diesel service (they are outfitted for two types of electrical traction), they would cost a ton to refurb for push-pull. However, some coaches may be available, whether VRE, NJT, MNRR, or SLE. Also, there are some former SPV-2000 demotorized Constitution liners down in NO for hurricane service. I think SEPTA and CTA may be retiring some stuff. As for power, there are surplus FL-9's (very, very old) that are about to be retired that could probably be had for a song. CDOT is also leasing Amtrak P-40's (which they may buy) they use for branch service which may become available. 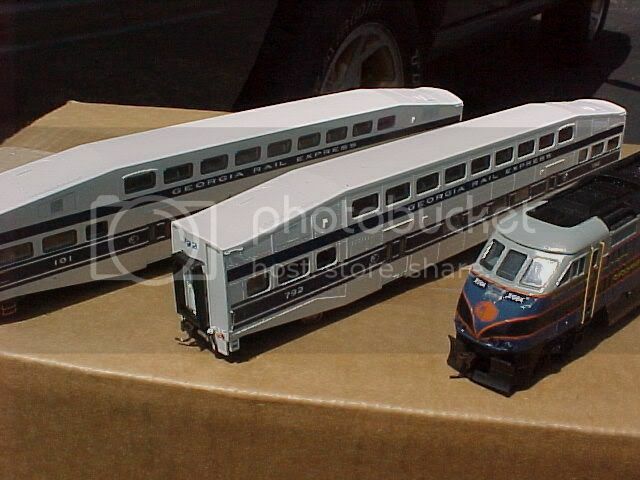 Also, Brookville just finished an order for CDOT and MNRR for BLG-20H's which may be suitable for this type of service. So there's definitely a demand, but a decent supply of second-hand stuff. The once-left-for-dead commuter rail line from Macon to Atlanta continues to have fresh life breathed into it, with vocal support from the governor and the state's transportation commissioner. Thursday, representatives from governments along the proposed line, as well as a possible connector from Atlanta to Athens, met to discuss rail possibilities. Proponents calling themselves "Georgians for the Brain Train" put the summit together in Hampton, their name a reference to the connection between the University of Georgia in Athens and Georgia Tech in Atlanta. The expensive issue of who's going to pay for train operations remains, but the mood was very positive, said Carl Jackson, head of the Macon-Bibb County Transit Authority.Jackson was a panelist at the summit and said there was "a lot of interest to take this to the next level." Macon Mayor Robert Reichert and City Council members Larry Schlesinger and Tom Ellington attended, he said. Gov. Sonny Perdue and Georgia Department of Transportation Commissioner Gena Evans have both voiced strong support for commuter rail. Evans called it a top priority during a Monday trip to Macon, and the governor has called for a line from downtown Atlanta to Griffin in the next few years. That would take the line even farther than the DOT committed to build it when it signed off on a line from downtown Atlanta to Lovejoy, in the city's southern suburbs. 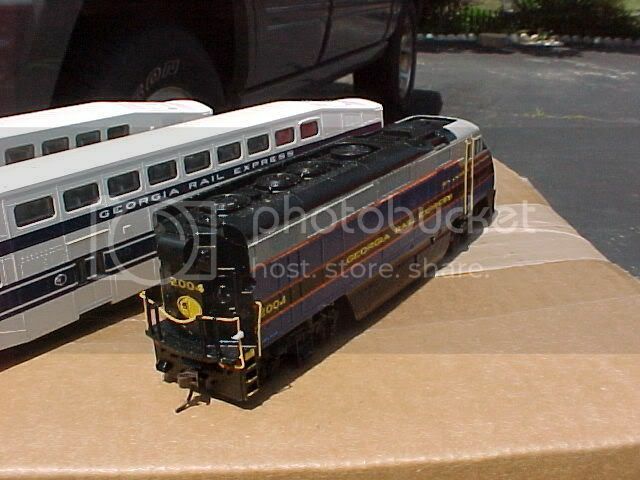 Several years ago I did a custom paint of a "Georgia Rail Express" train as a donation to the GRPA to stimulate interest in GA Commuter Rail. 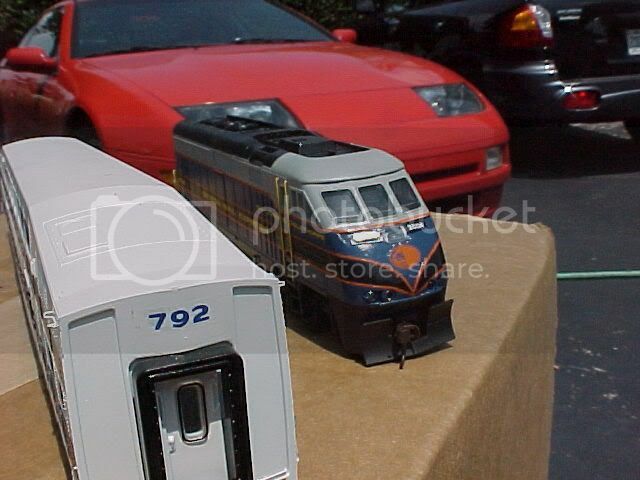 Doug Alexander used the models in talks he gave and displayed them at train shows. 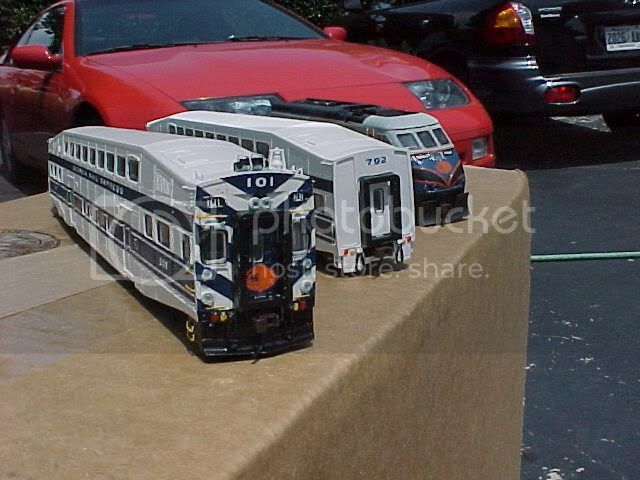 A group borrowed the train for display somewhere in GA and the three coaches disappeared. Anyone who can help locate those coaches will be rewarded with $100.00 cash by myself. a transportation bill has finally been passed in georgia.. any comments? Won't do a darn thing for Commuter Rail in Georgia any time soon.